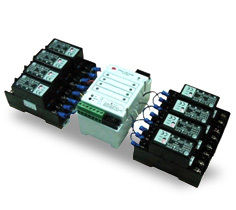 ALCL-S8AS As a lighting controller that acquired the LonMark3.2, ALCL-S8AS provides 8 latch relays. It also provides assured connection with the LonWork network while excellently performing in the effective buildings management as well as in saving energy. ALCL-SBAS As the features of ALCL-SBAS, lamp actuator objects and the scheduling function are embedded, making it unnecessary to install an additional scheduler, while it is possible to configure the lighting in various ways and LonWork FTT-10A free topology is adopted as default.